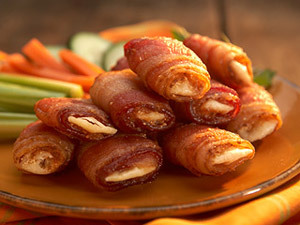 Place 1 teaspoon of freshly grated Parmesan cheese on each cracker and wrap tightly with a strip of bacon. Place the wrapped crackers on a baking sheet and put the baking sheet on the oven rack. Bake for 2 hours, or until the bacon is done. Do not turn. Drain on paper towels. Serve hot or at room temperature. You can also bake at 350 degrees F for 40 minutes if you’re in a hurry! Serve with fresh sliced vegetables.